Whilst this site already has planning permission for a waste recovery and combined heat & power plant, to enable the development of this site to be workable and viable, a new planning application will be submitted shortly to Walsall Council. Local residents and businesses were made aware of the proposals in 2012, which included a public exhibition in October. Since then the proposals has been developed further and there is now another opportunity to view and discuss the final plans before they are submitted to the Council. With a shortage of waste processing facilities in the region to treat and recover commercial and industrial waste, this facility is being developed to fill the gap. Without such facilities, waste is sent to landfill where it produces greenhouse gases and other contamination. 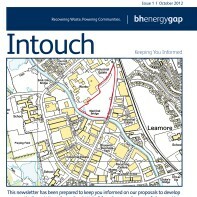 BH EnergyGap has listened to the feedback received from the initial proposals last year and is now ready to submit the final Planning Application. Our new planning application will be submitted April/May this year to Walsall MB Council. Details of the final proposals will be available on our website. This 3Rs facility (Resource Recovery and Renewable energy) will sort and segregate materials for recycling. The residual material will be used as a fuel to generate electricity or heat using advanced thermal treatment. The facility will be constructed in accordance with planning permission granted by Walsall Council and the required permits from the Environment Agency before start of operation. The syngas is used to produce steam in a boiler, which uses a turbo-generator to produce electricity for export into the national grid and/or supply local district heating or power. Representatives from BH EnergyGap will be there to discuss the proposals for the site and also assist on any employment, contracting interests.